This weekend we had the first signs that winter isn't far away, so now is the time to get busy and prepare your garden for winter. 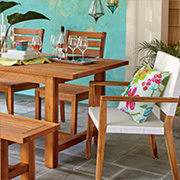 Summer might be over but if you need outdoor furniture, now is the time to shop around for furniture that is comfortable, practical and durable - before the next season arrives. 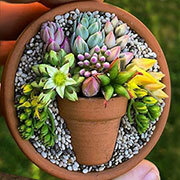 There's a new craze stirring up the Internet recently... miniature succulent gardens - a pot in a pot! 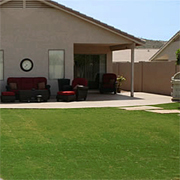 With climate change affecting weather around the world, many homeowners are replacing turf with low-maintenance landscape ideas. 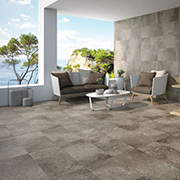 Update your outdoor spaces with the latest designs in non-slip outdoor tiles from WOMAG. South Africa has an abundance of sunny weather, making it the perfect location for harnessing the power of the sun with solar lighting. The time has come. 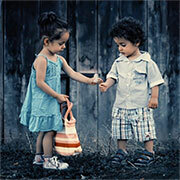 Your baby has left the cradle and entered into their exploratory phase. Their growing muscles and expanding curiosity can only mean one thing—it’s time for them to play outside. 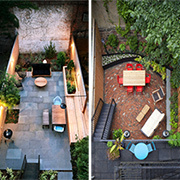 If your garden is blank and sterile, take inspiration from these lush urban gardens that offer a tranquil place to relax. 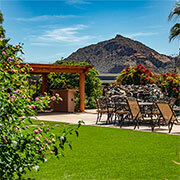 Outdoor kitchens are a growing trend, as homeowners look outdoors to extend living space. A well-designed outdoor kitchen can become the perfect feature in an outdoor entertainment area. 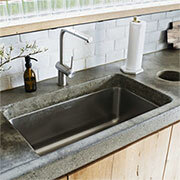 Global warming is bringing about climate change that will have a huge impact on how we conserve and use water. 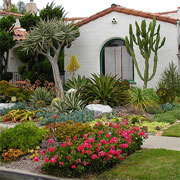 A smart garden is one that incorporates water wise gardening techniques and clever landscaping. 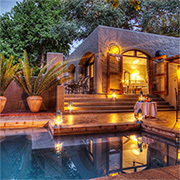 See how a luxury, 5-star game lodge in Botswana transformed its outdoor and indoor spaces using Cemcrete. 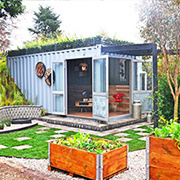 Discover how to create your very own 'She Shed' at Decorex Joburg this August. Builders looks at the latest landscape trends that reflect a desire to bring the indoors outside, creating a comfortable landscape that is both functional and beautiful. Turn that boring braai into a wonderful casual entertainment area where you can sit and relax and enjoy meals with family and friends. Whether you live in a townhouse development or city flat, we offer some great design ideas for compact gardens. 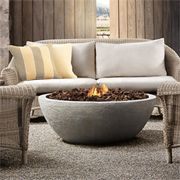 We are already starting to feel that spring is on the way, and it looks like it's going to be a hot one - one where you will want to spend more time outdoors relaxing in the garden or on the patio. 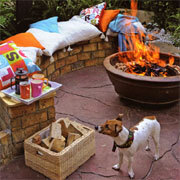 Refresh your outdoor space with colourful, patterned fabrics. 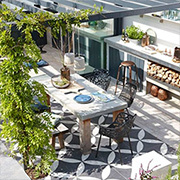 For those who don't have the luxury of a large garden, or only a concrete courtyard, there are plenty of ways to transform these areas into outdoor spaces where you will love to spend time relaxing or entertaining. From July 25 to August 30, 2015 see spring flowers in all their abundance at this year’s Spring Festival at Garden World. As valuable resources dwindle and water quality worsens, replacing lawn with hardscaping or artificial turf is not only good for the environment, it saves on your monthly bill and cuts down on maintenance. 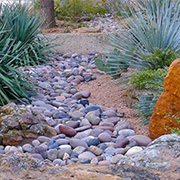 Many gardens have some sort of drainage issue; drain pipes that don't carry water away from the foundations, areas that become waterlogged during the rainy season, and a myriad of other reasons. Vibracrete - or precast concrete - walls are a common feature in many South African homes. 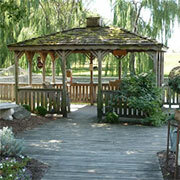 They offer an affordable way to close off a property and create a private outdoor sanctuary. But vibracrete walls can be an eyesore, or at least an unattractive feature. 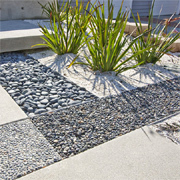 Sustainable landscaping is more than just planting a few indigenous shrubs in the flower beds. It's about creating a lifestyle in which both we and the environment benefit. 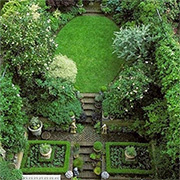 The best way to start is by planning correctly and to design a garden that will suit your budget. 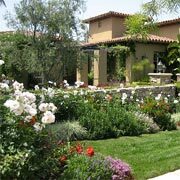 As climate change wreaks havoc on gardens, with high temperatures and either low or high rainfall, designing a low-maintenance garden makes a lot of sense. 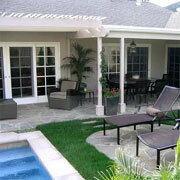 As homeowners gravitate outdoors, the sky is the limit when designing an outdoor living or entertaining area. Not only practical, adding lighting to your outdoor or entertainment areas extends the amount of time you can spend relaxing in the garden. Today's gardens not only consider the environment, they are designed to partner with the surrounding area and consider the needs of local wildlife. 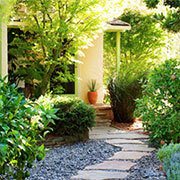 Take a look at a selection of garden design ideas that incorporate local plants and vegetation to the fullest. 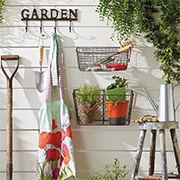 Buying a brand new home more often than not means planning a garden from scratch. But where do you start when starting a new garden? 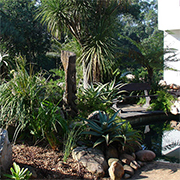 The Mooibos garden is a collaboration between 6 UCT students. The concept behind the Mooibos Garden is to allow anyone to have a vertical garden on their wall. 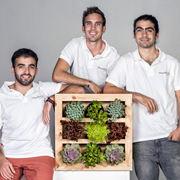 The product consists of a wooden framed box, which securely holds an array of pot plants. Townhouse living does offer some benefits, but privacy is definitely not one of them. 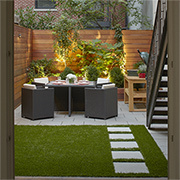 Most townhouse gardens have hardly any privacy, and many are overlooked by units on higher levels. 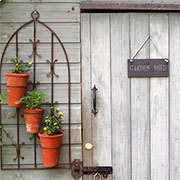 So how do you establish some privacy in your own garden? 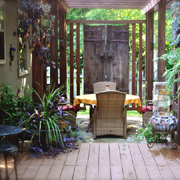 If you're like many homeowners, you consider the patio an extension of your home. So it's fair to ask: Would you be just as comfortable nestled in with your favourite book or preparing a meal in your outdoor space as you would in your living room or your kitchen? 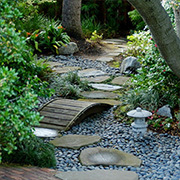 To plan the garden of your dreams it's important to think about how you will use the space. Will it be used for entertaining family and friends? Is it a place to retreat? Will it be used as a play area for children ? 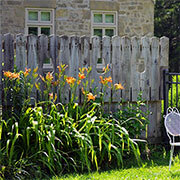 Is your garden old fashioned or trendy? 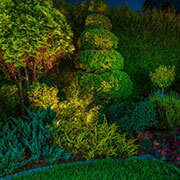 Gardening has evolved over the past six decades and eras of fashionable plants have come and gone. We take a look back at the highlights ... of where gardening has come from and where it is going. 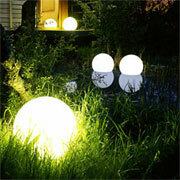 Add soft illumination to your outdoor spaces with the Moonlight Globe. These beautiful orbs add atmosphere and light to any garden, patio, pool deck or entertainment area, or can simply be used for contemporary decor. 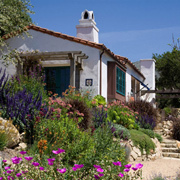 Becoming a standard gardening standard in many new, upscale homes, Xeriscaping is a method of gardening that allows for easy maintenance and water wise design. 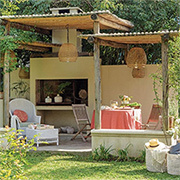 When at home in the garden you need a cool, shady spot to sit and relax - a garden oasis - and this feature will inspire you to create a wonderful spot for taking time out on weekends. 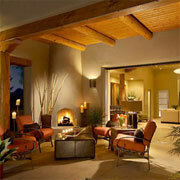 We all want a home that is welcoming and attractive to look at. 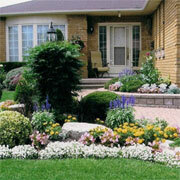 So how would you go about adding curb appeal? 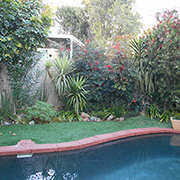 Winter is the perfect time to action any changes you want to make to your garden, or put in a pool. 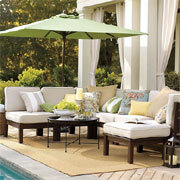 It allows the garden and pool time to settle in and be ready for the summer months. 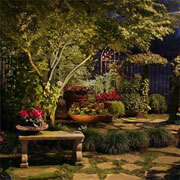 Illuminate your summer garden with an enchanting space for relaxing or entertaining after the sun goes down. 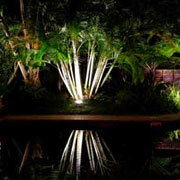 You can easily transform a garden space into a nocturnal paradise perfect for evenings in the garden. Just like your indoor living spaces, outdoors areas can become an integral part of the home by providing more space for seating, entertaining or casual dining. We South Africans naturally move more of our attention toward the outdoors as the weather starts to warm up. Thoughts of sipping cool beers while sitting comfortably atop cozy loungers and braais instantly come to mind at the mere mention of summer. 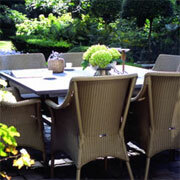 There are plenty of different materials used to make patio furniture. 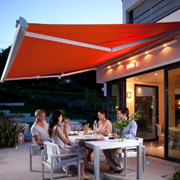 Remember what your main use of the patio will be, that will help you decide on your purchase. 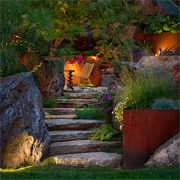 Lighting up the garden around a home not only provides a wonderful atmosphere for summer entertaining, it also serves to provide additional security, reduce the number of accidents in a night garden, and even increase the value of a home. 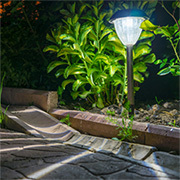 Make a combination of different light sources in order to make your garden lighting system more impressive and less power consuming. 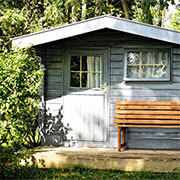 Sheds, or Wendy houses, added to summer home yards or gardens offer homeowners extra space, without costing a fortune. Grass can be challenging to maintain, so if you are looking for something that is less demanding, there are more options than you might think. 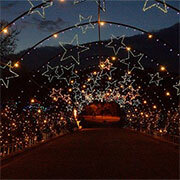 This holiday season is to make a Christmas light tunnel for your driveway. 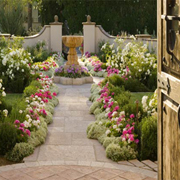 Developing a fantastic landscaping does not really have to be that much of an overwhelming task if you have a small idea of how you want the outdoor of your home to like. 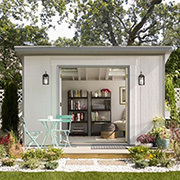 We take a look at some of the unique ways you can use your backyard shed for much more than just storage for yard tools and accessories. 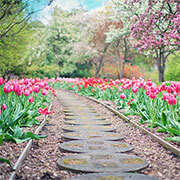 Establishing a garden is not as easy as it seems, especially when setting up your garden requires a degree of planning. 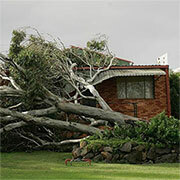 Here are some tips to make your house feel as if you are living on an island. All information, images, or otherwise, are the property of Janice Anderssen, or relevant copyright holders and for the latter Home-Dzine Network claims no intellectual, or any other property rights. Articles also provided by various sources. See our Terms and Conditions relating to use of this website.